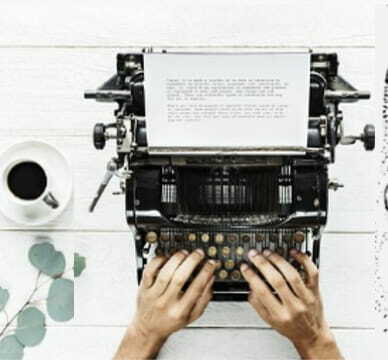 Here are 3 free online story planner websites. These websites let you plan a story or a novel which you are about to write. Here they offer you various tools that will be useful for your story. You can create various scenes, define characters, add relationships between characters, and do some other things. You can save these details online and later export them if you want to. And not only planning but using some of these websites, you can even start writing your story according to the plan that you have created. And once you are done with the story, you can download it as an e-book as well. In the following websites, you can create a story plan by adding different information in an organized manner. You can create different universes, characters, locations, items, plots, and some other custom assets. And if you want then you can create a visual story in some of these website. After creating your story, you can export that or save it online. However in some of these websites, you can only create a limited number of stories. Notebook.ai is an amazing story planner website that you can use easily. It lets you create universes, characters, locations, items, etc., for your story. It lets you save the plan you create and you can edit that anytime. In the free plan, you can create 5 universes and there is no limit on characters and other story assets except 50 MB images can be uploaded only in the free plan. It offers you an interactive online interface which you can use to create a story plan in the way you want. You will need an account to use this website to start creating your story plan. Reach the homepage of this website using the above link and then start creating the story plan. 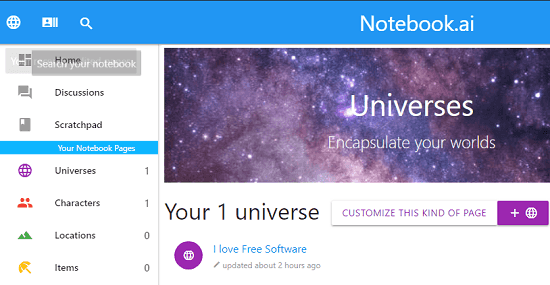 Once you are on the dashboard, first create a “Universe”. Give your universe a title and a write a small description about it as well. You can create 4 more universes there for different stories and then move to the next part. After universes have been created, you can start creating other story assets like characters, locations, etc. And while creating these, you can specify the other details corresponding to each asset. 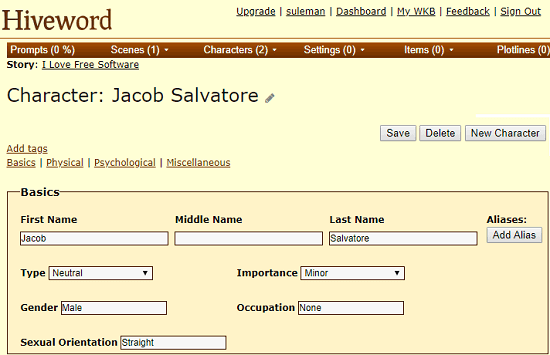 For example, while creating characters, you can specify their name, gender, nickname, role, etc., like parameters. And then you save this data and even download it in CSV file later when you want. Hiveword is another free online story planner that you can use. Here it offers you a simple interface to plan your story easily. Just like the website above, here it lets you plan a story by creating different story assets. Here you can create scenes for your story, create characters, different chapters, create plots, and some other assets. On its interface, you can choose what you want and then create your story accordingly. It lets you write your story according to your plan on its online interface as well. In the free version, you can create unlimited stories and create unlimited story assets but some features are limited such as image upload. Also, in the free version, you cannot create custom story assets. Just go to the homepage of this website using the above link and then sign up for a free account. After that, you can start planning story. So, from the dashboard create a plot and then specify title of the story and then specify a small description about it. After that, you can create the story, add characters, screens, add other items in the plan. And while adding the characters in your story plan, you have to specify the information like name, type, gender, importance, physical appearance, psychological behavior details, etc. You can create a story plan in this way and similarly, you can create plan for other stories as well and save all your work online. 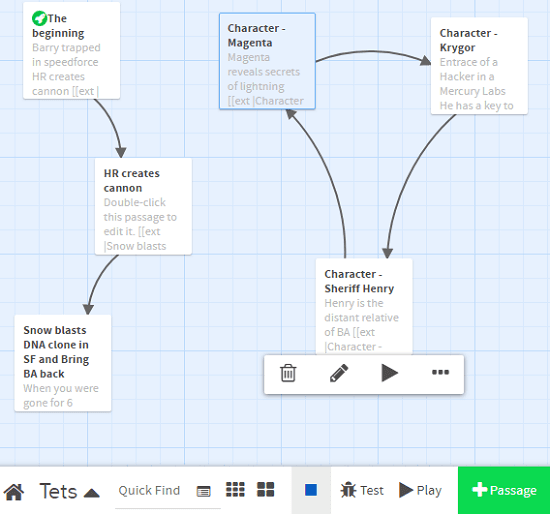 Twine is not actually a story planner but works in different manner. Basically, it is a visual story planner which you can use to create a visual story plan. Here you can create the various story assets and other part of the story in form of different blocks. And then you can connect them to form a flow. You can create as many blocks as you want and align them on its interface. After that, you can save the current view as an HTML file as well. Not only this, but you can later play a story using this tool in an interactive manner. And not just the online version, but it comes as a desktop software as well and we have covered that. You can read the review of Twine here. There is no registration required in order to use it to plan a story. Just reach its homepage, create a passage, and then join them using the links. After that, you can create the story flow and create other characters in the story. You can create different plots and then connect them with each other. Also, you can mark the starting point of the story and then simulate that. After when you have planned the whole story then you can export that as an HTML file. These are the best free online story planner websites that you can use. Use these to create a plan for your story or novel and then save that online for free. You can easily create different scenes, plots, and create unlimited characters for your story on these websites. And then you can start writing your story on these websites and export that.